I saw one of these for sale and didn't buy it because I thought it was too expensive at $25... never seen another! I am not sure which island this hotel is on. 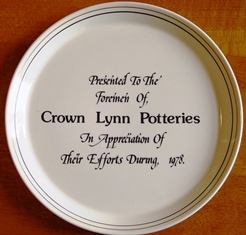 And this was a thank-you plate to foremen. 1978, looks to be Forma shape. 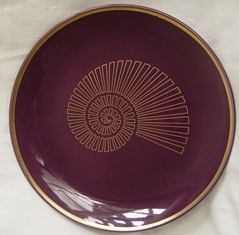 That is a splendid design and we have to work out which pattern the plate is. Fantastic plate. Known as a service plate they would be on the table when the guests sat down and remove as the first course was served. I was Export manager at the time and put the deal together. Was a very difficult plate to produce as the purple was quite sensitive to the thickness of glaze being spot on. Also was difficult to get the Nautilus shell centered. Hi Chris, the NZ market was handled by Don Matthews and Geoff Agnew but its possible I met your father as there was often a social gathering during visits of important buyers. I don't remember the year the the pen holder was made. It was a thank you gift. Mark Cleverly was well know for type face design and did the design which was produced in house. Think it was a colour from Carousel for the slip glaze rim. Hi chris.hall and welcome to the site. 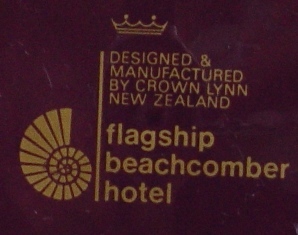 The Beachcomber plate is very hard to find so this will make it quite collectable. The one above and the one from Val Monk's book are the only ones that I've seen, though I don't know how much it would fetch. 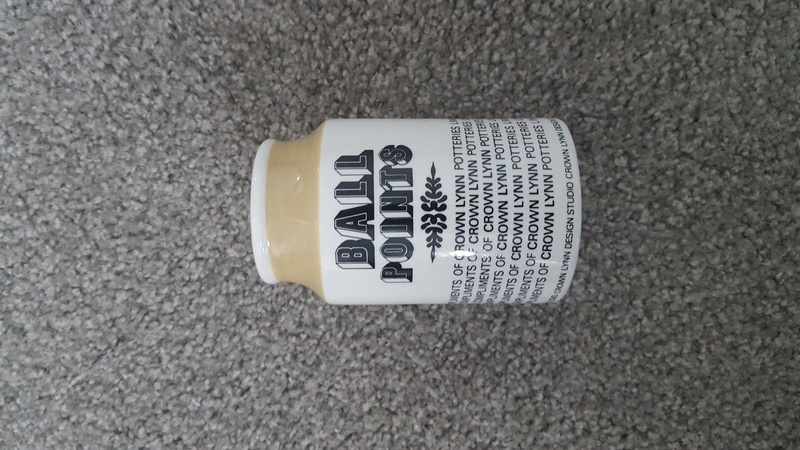 The Ball Point penpot was first made in 1964 and is seen more often so wouldn't be worth a lot at this time.